My Place: Happy Birthday PPF! Paint Party Friday is 4 today! Wow 4 years that is a massive achievement by Kristin and Eva. It success I am sure is the sense of community there is amongst participants. We all support each other in our growth as artists; I know that my art has benefited from being part of PPF. To celebrate this event Eva and Kristen has asked us to do selfies. Here is my attempt. I actually got my oils out and used an old canvas that already was painted with dark blue. I am in the throes of packing for my move in a couple of weeks. However I managed to get some quiet time. I had to go to Greytown a town further down the valley. It is an old colonial town and has lots of lovely settler houses set in beautiful garens. But my favourite bit was my walk and picnic lunch in a stand of original bush land that has been preserved near the camping grounds. The shade and green was bliss on a very hot day. HAVE A GREAT CREATIVE WEEK ALL PPF PEOPLE. Sharon I love love love your selfie so much! Your style is amazing! Love the photos! Thanks for sharing! All the best with the move! Hello Sharon, how nice to see you with your lovely green hair. I'm very impressed that you are packing to move and managed to find time to make this marvellous oil-painted selfie. How beautiful to see Greytown, what a lovely name, the house and the green woods look charming. your portrait is wonderful Sharon and I love your hair! I love your selfie. You look so artsy in your view with your green hair. And of course even if your hair is not green your are obviously very talented. And I love your photos. That house looks so quaint. Good luck getting ready for your move. fantastic self portrait Sharon! Good luck with the move! Oils, that's great, a true self portrait! Your hair is so lovely! I like your green hair in the selfie - great painting style. Hope your house move goes smoothly. I love all your faces and its great to see your style coming through in your selfie. Your painting is beautiful, I love the hair! Awesome selfie Sharon. What a beautiful home and it's surroundings. Very serene. Happy PPF! 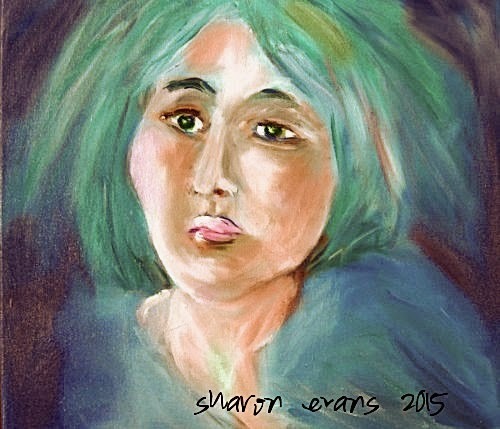 Beautiful and soft looking self portrait Sharon. Best of luck with your moving, and happy PPF! Just a lovely self portrait, and wonderful photos! I love all the shades of green and blue in your beautiful self-portrait. I think you may have been inspired by the colors in Greytown. Happy PPF and have a blessed move, my friend! Beautiful selfie! I'm loving this celebration and "seeing" everyone. I really love your portrait. Don't know how you managed in the midst of packing to move. The photos are beatiful! Oils for the occasion! Excellent portrait. Wonderful portrait - love the color! Beautiful photos too. I did not notice we could paint a selfie, so I didn't. I forgot to say.. the colors and the light is fantastic! And thanks for sharing that lovely green landscape, too ~ it's a welcome sight to me as I wait (and wait) for the winter snow to melt!